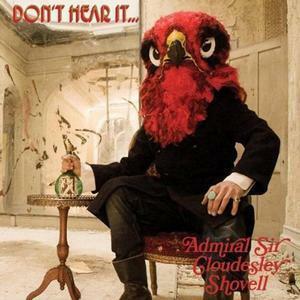 Review: Admiral Sir Cloudesley Shovell - Don't Hear It...Fear It! Get the Shovell, there's rock and roll to dig. Named for a 17th century English naval commander and taking hints from a giant red bird, Admiral Sir Cloudesley Shovell plays things for authenticity on Don’t Hear It…Fear It! Influences are handpicked from bands like Black Sabbath, Deep Purple and MC5. The Shovell, as they are called by fans, come right smack dab in the middle of a significant movement to resuscitate 70s rock awesomeness. Luckily, these guys are definitely pretty good at what they try to pull off. The aforesaid desire for authenticity works in their favour, as Don’t Hear It…Fear It! is recorded with enough low-fi tricks so as to resemble a modern grindhouse film revival. The whole shebang sounds like it’s pouring off of grimy vinyl and soaking into the shag carpet. The trio – drummer Bill Darlington, bassist Louis Comfort-Wiggett, guitarist and vocalist Johnny Gorilla – provide an airless quality, like nobody’s cracked a window in a long time. The subsequent pong is useful, soaked as it is in big cloudy riffs and lots of peculiar pseudo-psychedelic interludes. As far as debuts go, Don’t Hear It…Fear It! gets the job done like a blast in a time machine. It is even divided into “sides,” those archaic markers that would inform listeners as to when to flip the recording over, but the whole arrangement works to spawn a complete rock and roll record that is as effectively now as it is effectively nostalgic. At no point does the Shovell seem to long for better days. Their rock tricks are totally modern and the production values, like the sanding-off of the vocals, come courtesy all the advantages of studio magic. The songs deserve to be heard in order in one drawn-out sitting, with unstable cadences and risky riffs telling a complete melodic story. Whether it’s the muddy opener “Mark of the Beast” or the gulping jam of “iDeath,” Don’t Hear It…Fear It! invokes the sort of scope and scale that used to come with records that haven’t been dusted off in a while. There’s an unapologetically filthy quality that days of showering won’t take off. The problem is that the Shovell are playing into a teeming field. There are a lot of new-ish bands playing cards from the 70s and planting seeds, but not all of them exhibit the commitment and realism found on this record. As long as these cats continue to heed the giant red bird, all should be well.